Students at The Sixth Form College in Solihull have raised almost £1,000 to fund a school in The Gambia. The pupils held a quiz night to raise money to support a school in Abuko, near Banjul called the Jemus Jungkung Jammeh Memorial Nursery School. The school was established by Hamstead Hall School in Handsworth Wood and the college became involved in the project for the first time last year. A second group of 24 students are heading out to volunteer at the school in November and all students and staff are spending the months leading up to the trip fundraising for the project. 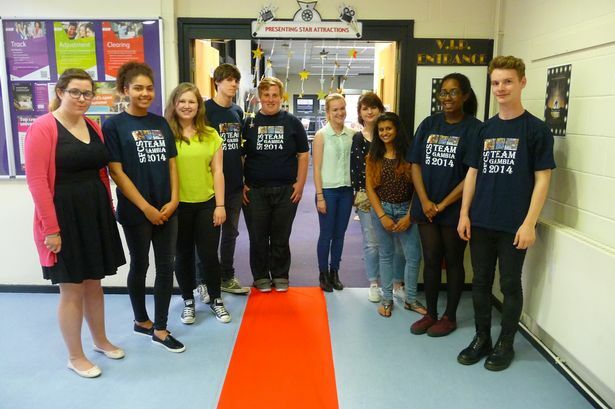 The students held an Oscars theme quiz night, run by quiz master Alan Timber and retired member of staff John Ingham. College vice principal Janice Hamilton said: “Many thanks to staff and parents of Team Gambia 2014 who made up the majority of the teams competing. With food and drink, not to mention a raffle, a great time was had by all. “It was also fantastic to have many of the students who are going on this trip in November there to help the night run smoothly. They are discovering what hard work fundraising is but it’s for such a worthwhile cause and the experience will be so beneficial to their development as young people too. The £940 raised from this event goes into the Team Gambia 2014 fundraising pot and follows a staff-run Easter Bake-off back in April, which raised an extra £290 towards the project. Anyone interested in supporting the college’s project can call: 0121 704 2581 or email: marketing@solihullsfc.ac.uk.